Global swept frequency capacitive sensing market expected to reach approximately USD 185 million in 2025, at a CAGR of 35.75% between 2019 and 2025. The capacitive sensors used in the touch panels are of different types, such as surface capacitance, projected capacitance, self-capacitance, and mutual capacitance. The report covers a forecast and an analysis of the swept frequency capacitive sensing market on a global and regional level. The study provides historical data for 2016 to 2018 along with a forecast from 2019 to 2025 based on revenue (USD Million). 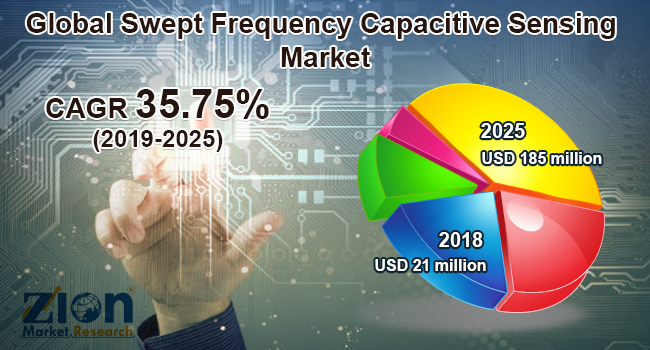 The study includes drivers, challenges, and restraints of the swept frequency capacitive sensing market along with the impact they have on the demand over the forecast period. Additionally, the report includes the study of opportunities available in the swept frequency capacitive sensing market on a global level. This report offers comprehensive coverage of the global swept frequency capacitive sensing market along with market trends, drivers, and restraints. This report includes a detailed competitive scenario and product portfolio of the key vendors. To understand the competitive landscape in the market, an analysis of Porter’s Five Forces Model for the swept frequency capacitive sensing market has also been included. The study encompasses a market attractiveness analysis, wherein all the segments are benchmarked based on their market size, growth rate, and general attractiveness. The study provides a decisive view of the swept frequency capacitive sensing market based on technology, application, end-user, and region. All the segments have been analyzed based on present and future trends and the market is estimated from 2019 to 2025. By technology, the swept frequency capacitive sensing market is divided into surface capacitance, projected capacitance, self-capacitance, and mutual capacitance. The application segment is categorized into smartphones, laptops, tablets, wearable devices, interactive monitors, touch-based human-machine interface, digital signage, and others. Automotive, aerospace and defense, consumer electronics, healthcare, industrial manufacturing, construction, and others comprise the end-user segment. The regional segment includes the current and forecast demand for North America, Europe, Asia Pacific, Latin America, and the Middle East and Africa with further division into the U.S., UK, Germany, France, India, China, Japan, and Brazil. Some key participants of the global swept frequency capacitive sensing market are Microchip Technology Incorporated, NXP Semiconductors, ST Microelectronics, Texas Instruments, Synaptics, Renesas Electronics Corp., Analog Devices Inc., Infineon Technologies, Intel Corporation, Cypress Semiconductor Corp., Chris Harrison, Vestel Visual Solutions, InFocus Corporation, Cirque Corp., and Atmel Corporation.